Over the weekend we packed away Christmas. We didn't have a lot out to begin with so thankfully this task wasn't too daunting. 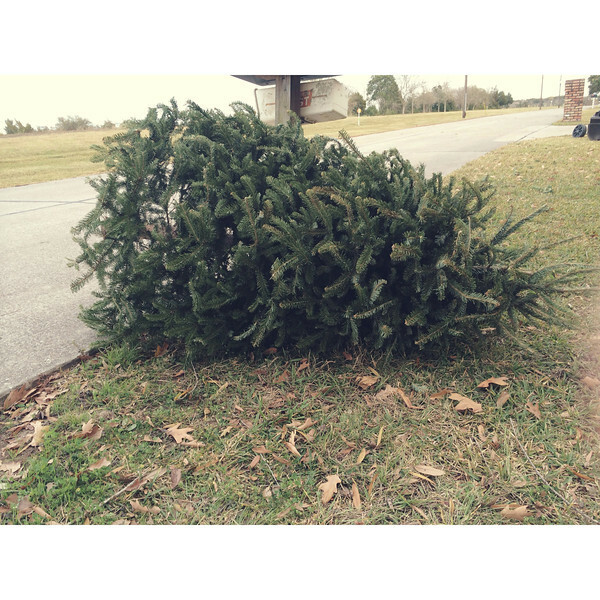 Good bye Frasier Fir 2013, you were a good little tree. It makes me a little sad to see him lying beside the road waiting for the trash. But not so sad to leave Christmas up for one hot minute longer. After the clearing, in a flurry of fed-up-ness, I declared we must rearrange the family room furniture. Because of the layout of our room we don't have a ton of options, so we threw it back to the set-up a few years ago with the couch facing the TV armoire and the chairs on either end (we previously had the couch to the side, not that you care but I feel the need to explain). It feels new, even though technically it's not, and therefore I am satisfied. It also feels a tad cozier. So there's that. 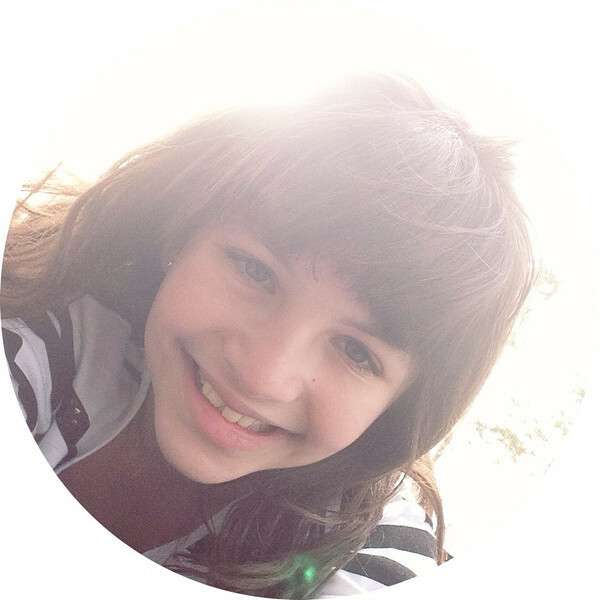 Annelise spent the last afternoon of her holiday break jumping her heart out on the trampoline. I think all the recent New Year's Eve trampoline shenanigans inspired her. She's obsessed with doing flips, which scares me, but keep my fingers crossed she lands right. She's also talking about wanting to join a tumbling gym, which sounds fun but also slightly scary. I don't know if we're up to adding one more thing a week either, but maybe. Monday morning was a rude awakening after the general sloth like state of our holiday break. Annelise was excited though to see her friends and even more excited to get to use her new Vera Bradley backpack (Cocoa Moss pattern) and lunch kit (Lola pattern) that she got for Christmas. We weren't going to get her a new backpack mid-year since her plain old plaid one was still perfectly fine, but then I got an email of a local shop offering 20% off so, in a nutshell, we caved. She's had a good return to school so far, you know, for the whole two days, and seems to be getting back into the swing of things, as am I.
I'm thankful for the return of routine. There's also something refreshing (yet intimidating) about the start of a new year, shaking off the sludge from the old and starting things over. I decided it was the perfect time to revisit my sorely neglected 10 year journal. And when I say sorely neglected, I mean most of the daily five lines for 2013 were left empty due to my own apathy. 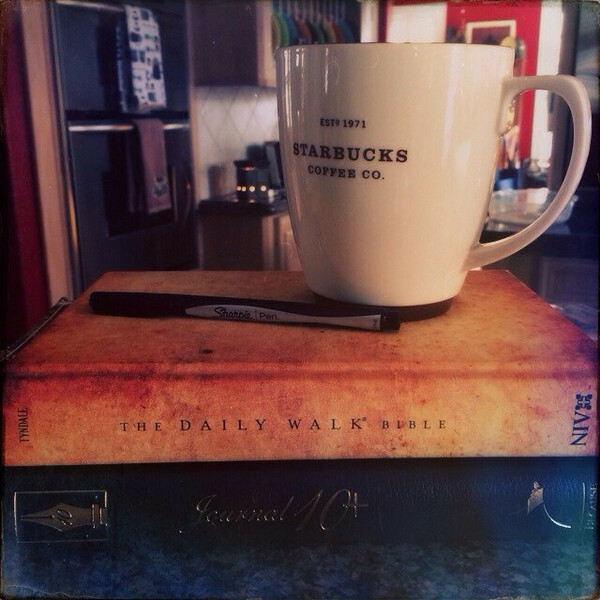 Even though I blogged regularly I missed journal writing, even just five lines a day. So here's to no more, or at least very limited, blank spaces in 2014. I also started reading The Daily Walk Bible, which I've had for a few years, and have barely used. Of course. There are usually two or three chapters to read a day along with a bit of commentary or devotional type thoughts. I think it will be a good way to have some daily quiet time and get the entire bible read throughout the year. Or at least try to. In other news, I've finally gotten back to the morning green juice, daily Shakeology and my workouts, which after a two week break filled with very little self-control when it came to sweets and junk is a MUCH needed thing. 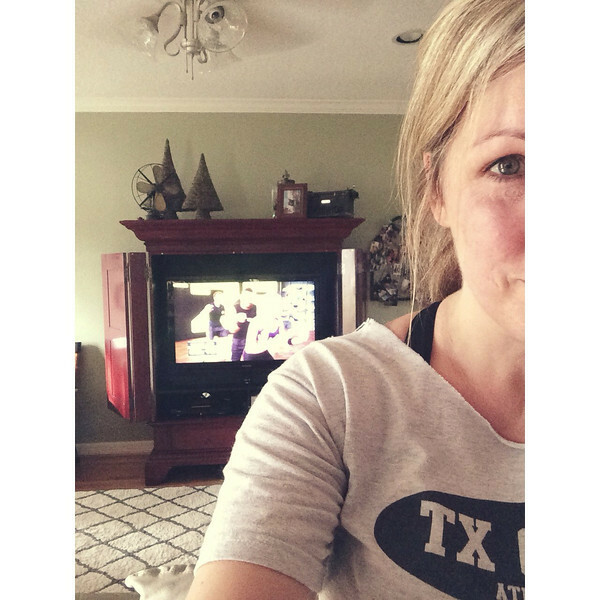 I'm doing Shaun T's Focus T25 (again) because the workouts are challenging yet only 25 minutes. After two days (Cardio & Speed) my calves are so sore but I'm determined to stick with it and get my third workout (Total Body Circuit) done later today. *I've started T25 several times and always fall off the wagon around day 3 because Total Body Circuit is from the devil or never make it past the first week and go back to TurboFire. I'm fickle that way. Trying hard to start off with good habits of exercise and Bible reading, too. I'm finding more and more that I love the month of January, just knowing so many others like me are in need of a fresh start. I've started 30 Day Shred again (T25 is on my radar) because I know how to fit it into my schedule (I can put her on mute now and listen to my music, thank God!) and it's still challenging carido-wise and strength-wise, but the consistency is the biggest challenge.